Director Joel Ruiz talks about his biggest worry when it came to his lead stars JM De Guzman and Rhian Ramos. While Kung Paano Siya Nawala is his first full-length project, director Joel Ruiz said he is not new to doing films. Ruiz was also behind the viral video “Crush” which was released by a local fast food company during last year’s Valentine’s day. “I trained in Mowelfund but my first film came out in 2004 so I’ve been an independent filmmaker since then. I’ve been doing commercials since around 2008. But I’m not going to leave commercials because I also love commercials but I’d like to constantly do movies as well. I love [that] TBA studios gave me total creative freedom. I feel so grateful. I feel so blessed that they let me do my thing,” he shared during the Kung Paano Siya Nawala blogcon held last November 3 in Mandaluyong City. Ruiz shared the inspiration behind the story he first wrote four years ago about a guy named Leo who suffers from a condition called facial blindness. “I’ve always had this love story in my head about this guy who couldn’t connect tapos hindi ko siya mahanapan ng hook. Then I stumbled into face blindness because I read an article and I started reading more about it and I felt it fits the theme of the story. In the movie, we take the audience on a journey on how he sees the world also. Pag hindi niya ma-recognize yung tao, yung audience din hindi ma-re-recognize,” he told PUSH. 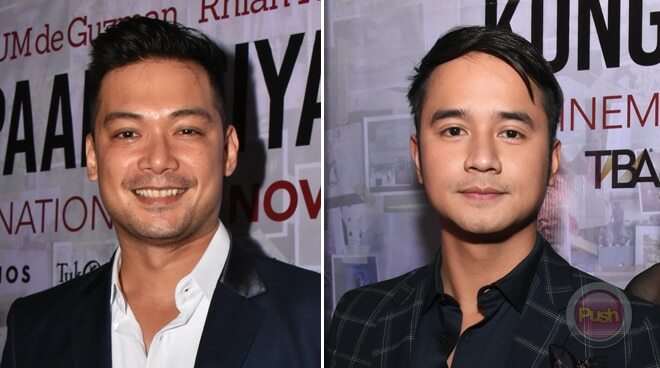 Before shooting began for the film, Ruiz said one of his biggest concerns were his two lead stars JM De Guzman and Rhian Ramos clicking onscreen. “I didn’t know they had chemistry. Kasi they’ve never met except for that one time 15 years ago, but they’re from different networks so I was super worried about the chemistry. I do know lang that she would be perfect for Shana and he would be perfect for Leo, but were they perfect for each other? I didn’t know. So we went through workshops. And it’s a good thing that they were so into the project that they threw themselves into it and sa workshops talagang tuwang tuwa ako sa kanila. And I hope people can see on screen the chemistry that I saw,” he said. Ruiz also said he felt the lead character Leo was perfect for JM whom he first approached even when the talented actor was on hiatus from showbiz. “I pitched to him the movie when he was still in rehab. Near the end of rehab papayagan ka umalis and then come back and in one of those leaves I pitched the movie to him. At that time he had already read the script kasi TBA Studios had already given it to him. Sobra yung connection niya sa character ni Leo. Sabi nga niya sa akin, ‘Direk, parang ako ‘to ah, parang ako yung character.’ So from there pa lang he was just so interested to do the film. That’s why nag-invest siya. He was okay na. This is the first project he said yes to after leaving (rehab). Nauna lang mag-shooting yung soap niya Araw Gabi. And I had to shoot around that schedule,” he explained. In one scene in Kung Paano Siya Nawala, Ruiz was also able to inject his personal advocacy of animal welfare and adopting instead of buying animals. “The character of Shana rescues pets and rescuing Emma is a big change in my life so binigay ko siya kay Shana. In fact, all my dogs appear in the film. My actual living dog Emma and there’s a rescue dog in the film and I set a scene inside PAWS Philippines. So yun yung little tribute ko,” he added.